This is the left-hand pane in Regedit when viewing the top-level of the Identities key. Under it are 2 sub-keys with very long hexadecimal names. These are called GUIDs, for Global Unique IDentifiers, and are generated automatically whenever you create a new Identity. This insures that every Identity has a unique identifier regardless of the "friendly name" of the Identity. you can see that Default User ID, Last User ID, and Start As all point to the same GUID. The Last Username is the Username of the corresponding Identity. This Username is what you see in the Identities Logon dialogue as the Identity Name. This shows the right-hand pane of the top level of a GUID sub key. Here you see that the User ID matches the GUID. 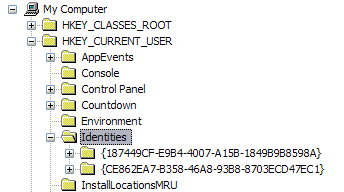 The Username is the name that you give the Identity using the File | Identities | Manage Identities control in OE.